Do what you feel in your heart to be right, for you’ll be critized anyway. This entry was posted in Photos, Quotations and tagged Eleanor Roosevelt, heart, Mt. Rainer, photos, quotation, sunset. Share two (2) “teaser” sentences. She wanted to understand the world, and she made a habit of chasing down information to its last hiding place, as though the fate of nations were at stake in every instance….She not only demanded to know whether mushrooms were plants or animals, but also – when given the answer – demanded to know why this was certain. 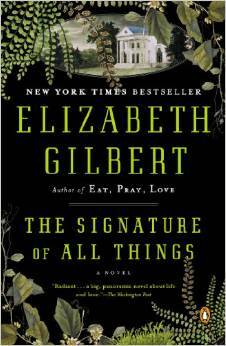 This entry was posted in Teaser Tuesday and tagged Elizabeth Gilbert, Teaser Tuesday, The Signature of All Things. The first sentence popped into my mind then slowly formed into a story. I may write more creative stories in the future. The stale bagel rested on the counter. Two days ago it was a perfectly perfect bagel with sesame seeds, poppy seeds, flax seeds, hint of garlic, and Parmesan cheese. A typical ‘everything bagel’. Sadly now nobody wants this ‘everything’ bagel and it sits forgotten on the counter waiting to be put into the trash. Our story begins two days ago when the stale bagel was a perfectly perfect bagel. Every day her mother packed a bagel into Callie’s lunch and every day Callie threw the bagel away. When she returned home, Callie’s mother always asked about her day and if she enjoyed today’s bagel choice. Her mother gained great pleasure packing a different bagel every day. Every day Callie would reply that her day was ‘just fine’. At first, Callie loved the bagel surprise each day: blueberry, cheddar, cranberry, honey nut, and of course the ‘everything’ bagel. However, too soon these bagel ‘surprises’ were more annoying and predictable than a delight each day. Callie just didn’t have the heart to tell her mother to stop packing a bagel in her lunch each day. Ironically, Callie’s mother grew to dislike packing a bagel each day and didn’t have the heart to tell Callie. Due to the miscommunication, Callie’s lunch could have contained items besides bagels: pb&j, tuna fish, ham & cheese, turkey & swiss, and perhaps an egg salad sandwich. Sadly, Callie’s lunch contained a bagel for ten years. Callie sighed and shrugged her shoulders as she stepped inside the ‘Bagels R Us’ door. Years of bagel resentment rushed through her head as she put on her bagel apron to begin her day. Her experience made Callie a ‘bagel expert’ although there really wasn’t a ‘bagel expert’ instead it was just the person who took orders and replenished the bagel supply. Everyone always asked the same stupid questions: ‘What’s the most popular bagel? Which bagel goes best with coffee? Are these bagels gluten free? Are these bagels low fat? Are these today’s or yesterday’s bagel batch?’ Callie tried her best to smile and kindly reply to each question, but inside she often had other thoughts. Callie noticed the ‘everything’ bagels needed to be replenished and she carefully placed a dozen fresh everything bagels inside the glass display case. Yes, our stale ‘everything’ bagel was indeed one of these fresh bagels. It was the last bagel in the display, so it’s chance of being eaten was slightly slimmer. The perfectly perfect everything bagel was ready to be sold, but you dear reader know that it never sold and is now stale. Callie was your typical college student who worked part-time to pay for books. Due to her past ‘experience’ she knew she’d be great as the local bagel shop girl. Of course, Callie was hired on the spot when it was discovered her bagel knowledge. (The positive references and strong work ethics may have been a factor too.) Callie shook hands and took her ‘Bagels R Us’ apron. She was due to start next week. Callie was average. This sounds completely harsh and unfair, but it’s true that Callie was average. She was always somewhere in the middle with grades. Her hair was neither straight, curly, wavy, or fizzy. It was just standard ash brown hair that hung below her shoulders and Callie constantly pushed back behind her ears. Yes, she could have cut her hair or styled, but again Callie was average and didn’t really bother with any of that. You may call her a ‘wallflower’ but she was neither loud nor quiet. Callie was just there. Callie’s ‘averageness’ made her blend into crowds, classrooms, parties, and sometimes at family functions. Callie knew she was average, because most people who are average are highly aware that they are indeed average. Callie was just an average college student who was average in every way, except bagels. She was not average at all when it came to bagels. The funny thing is this ‘average-girl-who-wasn’t-average when- it-came-to-bagels-girl’ hadn’t eaten a single bagel bite since she began working at ‘Bagels R Us’. Callie’s last bagel bite was ten years ago when she was a simple average eight year old who disliked the bagels her mother packed every day. However, even though her last bagel bite was ten years ago Callie was still considered a ‘bagel expert’, even though the term didn’t exist. This ‘bagel expert’ knew which bagels were most popular, which beverage worked best, differences between a breakfast and lunch bagel, and most importantly when to replenish the bagels. Customers knew the best time to buy a fresh, warm bagel. Callie simply smiled and handed the fresh bagel to eager customers. She never took a bite of a fresh bagel. When asked what was her favorite bagel Callie’s response was always the same: “Oh I just can’t pick one. I love them all”. Everyone has a ‘Callie friend’. Someone who’s always there, but you can’t seem to remember when you exactly met. This ‘Callie friend’ will help with homework, tell a joke, and lend you spare change. However, this ‘Callie friend’ isn’t normally the friend you first go to when faced with an emotional dilemma. Everyone enjoys the ‘Callie friend’ but she or he is just ‘there’. The ‘Callie friend’ is everyone’s friend, yet nobody’s best friend. Oh don’t take petty on the ‘Callie friend’, because they often think they have dozens of friends since everyone surrounds themselves around a ‘Callie friend’. You’re already aware that Callie is average, so it makes perfect since that Callie herself is indeed the ‘Callie friend’. However, this ‘Callie friend’ is a bagel expert. The ‘Bagels R Us’ doors close for the day and Callie checks which bagels still remain. As she tallies the bagel counts, Callie holds a secret. She wants to eat a bagel. Yes the ‘bagel expert’ who hasn’t taken a bagel bite in ten years wants to eat a bagel. She doesn’t know why, but something holds her back from eating a bagel. This is ironic because every day Callie could have eaten any delicious and fresh bagel of her choice. Every time she smiles and hands the bagel to customers, a small part of Callie wishes she could eat the bagel. Of course, she knows it’s silly and she can eat a bagel anytime she desires. Yet, Callie still hasn’t eaten a bagel. That all changes today. Callie is almost finished for the day as she begins to toss old bagels into the trash. The last bagel on the counter is our lonely, stale bagel. Callie picks it up and carefully examines the bagel as though it’s her first time looking at a bagel. Remember Callie is a ‘bagel expert’ who hasn’t tasted a bagel in ten years. Although, Callie herself views herself as just an average person and never an expert about anything. Callie knows she’s been silly these past ten years to never bite into a bagel. She cracks a smile and makes a decision. The stale ‘eveything’ bagel’s fate has suddenly changed as it doesn’t end in the trash. Callie slowly opens her mouth and takes a small bite. She waits for something profound to happen, but nothing does. Ten years without bagels suddenly disappear as Callie finishes the stale bagel. However, it isn’t a stale bagel to Callie, instead it is a perfectly perfect bagel that finally made her an official ‘bagel expert’. This entry was posted in Writing and tagged creative writing, free write, story, writing. This week’s photo challenge is ‘fresh’. The official first day of Spring was yesterday, however it already felt like Spring for the past month. My photos for ‘fresh’ are Cherry Blossoms that show a fresh start for the season. Click here for additional ‘fresh’ photos. This entry was posted in Photos, Weekly Photo Challenge and tagged cherry blossoms, flowers, fresh, spring, weekly photo challenge. 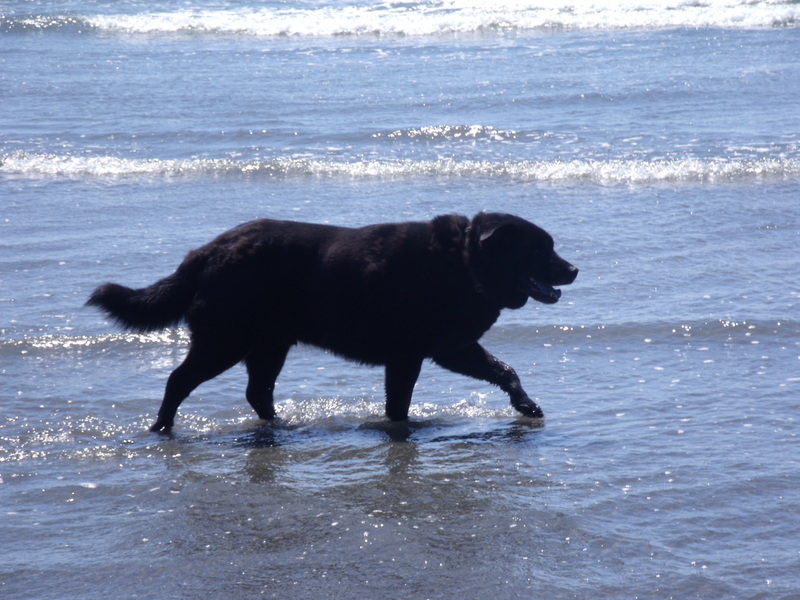 This entry was posted in Foto Friday, Photos and tagged beach, dogs, Foto Friday, George, Kalaloch Beach, ocean, photos, water. Death is a hard time period for all individuals, especially children who may have difficulties understanding exactly what death means. The first death experience a child may have is when a dear pet dies in their family. When a Pet Dies begins slowly and discusses how pets are part of the family and take great care. The book explains that sometimes their pet gets sick and needs a pet doctor or veterinarian. However, sometimes their pet is too old, sick, or injured for anyone to cure. Many people may gently explain to children that death is going to sleep for a long time, but When a Pet Dies explains that when a pet dies it isn’t alive so it can’t wake up. The book explains how people handle death differently. It’s okay to feel upset, cry, or desire to be alone. The important thing is to remember that there are loved ones who care about how you feel about losing your pet. When a Pet Dies finishes that with time you will no longer feel sad and you’ll feel happy again thinking about the good times with your pet. When a Pet Dies doesn’t talk down to children, instead it handles a difficult subject in a comfortable and understanding way. Fred Rogers understands children, which is clearly seen if you watched Mr. Rogers. When a Pet Dies never goes into detail about what occurs after death or anything religious. That can be discussed within your family. I recommend When a Pet Dies for both a pet and individual death. 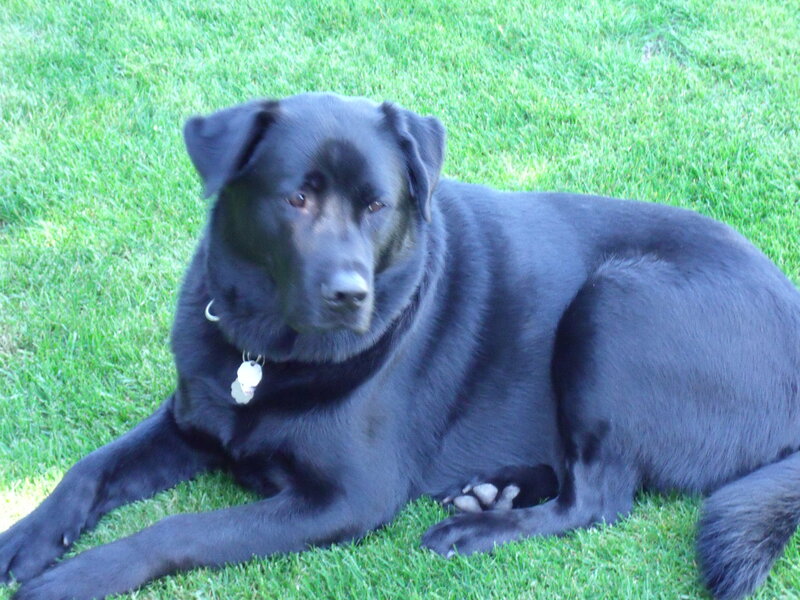 Here’s my family’s dog, George, who recently passed away. 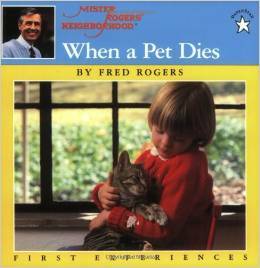 This entry was posted in Book Review, Children's Book, Picture Book and tagged Book Review, children's book, death, Fred Rogers, Jim Judkis, Mr. Rogers, pet death, pets, When a Pet Dies. Two stories and two cultures are told simultaneously in one book. 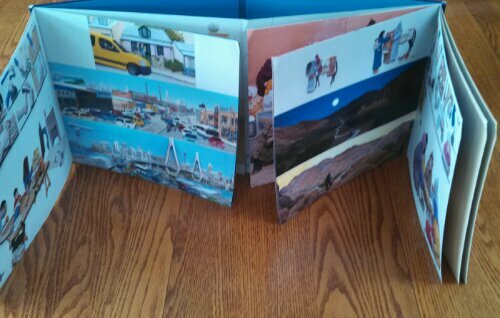 The stories appear side by side as the reader turns the pages at the same time. Mirror follows a typical day of two boys on opposite sides of the world. The stories take place in Sydney, Australia, and Morocco, North Africa. 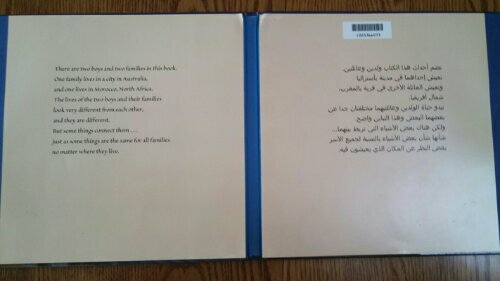 An introduction is provided in English and Arabic at the start of each story. The boys awake, eat breakfast, and travel to town for errands. The left story takes place in Sydney, Australia, and the destination is a hardware store by car on roads. 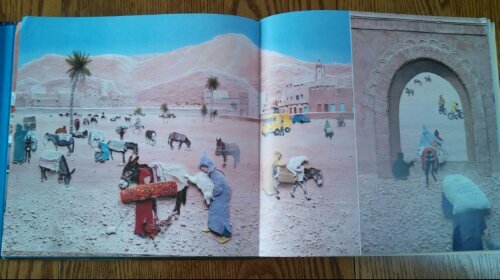 The right story takes place in Morocco, as the boy and his father travel by donkey on a trail to the market. The final pages display the family in Australia, with a new carpet bought on their travel and the family in Morocco, explores their new computer. The two families may appear different, but they mirror each other with common elements found in all families. I highly enjoyed Mirror. This wordless picture book is a very unique idea how two stories are told at the same time. Mirror really provides the reader with an experience about each boy’s day in their culture. The book’s illustrations are amazing with detailed facial expressions, market foods, car license plates, animals on the trail, carpet designs, and even keyboard keys. You really feel that you are there with the families. 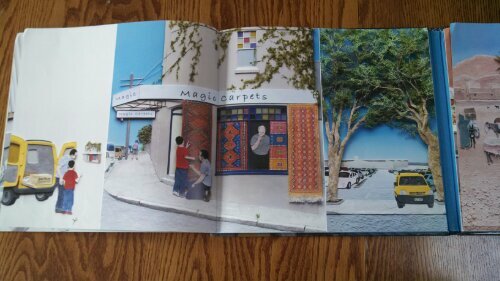 The illustrations are photographs of collages. The detailed collages are made with many materials, such as sand, fabric, wool, tin, plastic, paint, clay, and vegetation. I read some criticism about Mirror starting it’s not easy as a read aloud in the classroom. True, it may be difficult to handle the extended pages so perhaps independent or partner reading is best. Besides, you need to examine closely to view all the details. Another criticism was that Mirror displayed cultural stereotypes. Mirror is a great book to introduce children to different lifestyles and cultures even though we share similar traits. 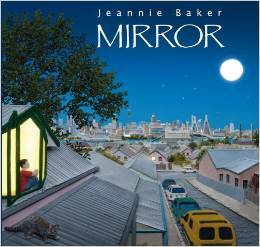 I recommend Mirror for older ages to understand the concept and handle the book with care. 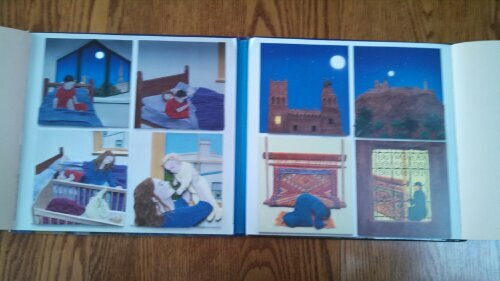 This entry was posted in Book Review, Children's Book, Wordless Picture Book and tagged Australia, Book Review, children's book, cultures, Jeannie Baker, Mirror, Morocco, wordless book, wordless picture book.